Although it's part of Portugal, the island of Madeira is closer to Africa than it is to Europe. A four-hour flight from London and Paris, this stunning subtropical island is often compared to Hawaii for its volcanic landscapes, rugged coastline and botanical wonders. We've highlighted nine reasons to visit Madeira, a destination that offers European charm in a tropical setting. On the northwest tip of Madeira, the village of Porto Moniz is home to a series of natural swimming pools formed by volcanic lava. They're naturally filled by the sea and the water is crystal clear. Although the pools are completely natural, there are handy amenities on site like changing rooms, a children's play area, restrooms, lockers, sun loungers and a snack bar. West of Funchal you can walk along the coastal promenade to rock pools cut into cliffs including Doca do Cavacas and Camara de Lobos. This striking island is made up of dramatic cliffs, lush valleys, black rocky beaches and a wild and wonderful interior criss-crossed by ancient water channels (levadas). Two thirds of the island is classified as a nature reserve and the volcanic soil means that pretty much anything can grow on the land. Beyond the capital Funchal, the island's peaks and ravines are pretty much deserted leaving them free for hiking, climbing, mountain biking and canyoning. Funchal's New Year's Eve fireworks display lights up the entire bay with a spectacular pyrotechnics show. The shape of the bay provides a natural amphitheater and fireworks are set off from more than 50 different spots. It held the Guinness World Record for the largest fireworks display in world in 2006 and remains one of the best places to see in the new year. The tradition dates to the 17th century when huge bonfires were lit up on the last night of each year. The island's airport was renamed in early 2017 to honor Madeira's homegrown hero, Christiano Ronaldo. This Real Madrid and Manchester United superstar was born in the Santo Antonio neighborhood of Funchal and there are tributes to the footballer across the capital. The Pestana CR7 is a boutique hotel by the harbor decorated with memorabilia including signed shirts and a bronze sculpture by the entrance. It's located above the Christiano Ronaldo Museum, home to a vast collection of trophies, life-size mannequins, photographs and fan mail. You're also likely to see posters, street art, billboards and merchandise depicting Ronaldo throughout the island. Where better to take a cable car up a mountain for a toboggan ride than on a subtropical island that rarely sees snow? Visitors flock to the hilltop town of Monte to take a bone-rattling 'toboggan' ride into Funchal in a wicker sled guided by men in rubber-soled boots that serve as human brakes. This traditional method of transport dates to 1890 when locals came up with an easy way of traveling down the steep, winding road into the capital. Don't miss the cable car ride up to Monte, a 15-minute journey that offers panoramic views of Funchal Bay and the ocean. Madeira's fertile soil and warm climate make it a top wine producing spot and the island has been producing some of the world's best fortified wines for over 500 years. Madeira Wine can be enjoyed both as an aperitif (served dry) and a digestif (served sweet). Head to the charming fishing village of Câmara de Lobos for a free tasting at top wine producer, Henriques & Henriques or in Funchal join a tour and tasting at Blandy's, a famous wine lodge that dates to 1811. Known as the 'island of eternal spring', Madeira's subtropical climate makes it a great destination to visit all year round. The hottest months are August and September when temperatures reach around 26°C (78℉) but it's a popular spot to seek out winter sunshine as temperatures hover around 19°C (66℉) in January and February. 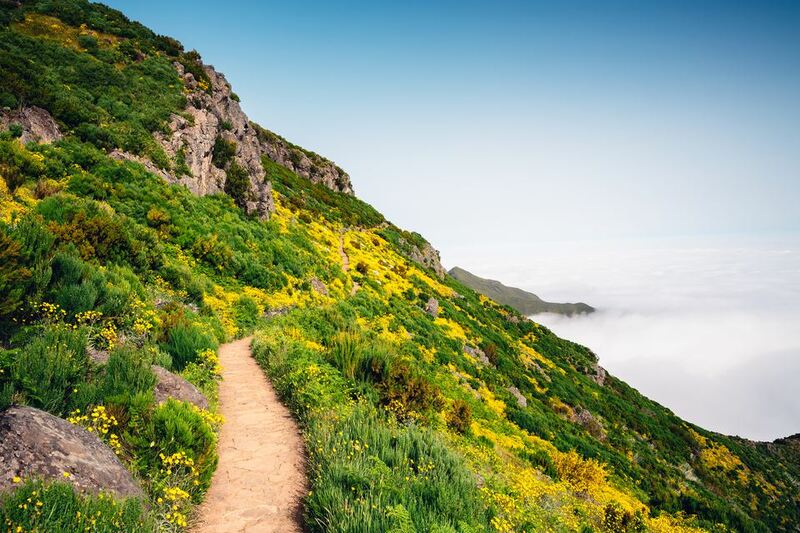 Given Madeira's diverse landscape, it has quite dramatic microclimates which means that you're never far away from sunshine, wherever you are on the island. For knee-trembling views of Madeira's stunning coastline, head to Cabo Girao where the best viewpoint is from the suspended glass platform at Europe's highest skywalk. The lookout spot is 580 meters above sea level and the views stretch past the cute town of Câmara de Lobos into Funchal. It's free to visit and you can grab a coffee from the on-site cafe to calm your nerves before or after your trip. While there consider riding the Rancho cable car down to the beach at Fajãs do Cabo Girão. Get a taste of local life at the Mercado dos Lavradores (workers' market), an Art Deco food market in Funchal that dates back to 1940. The two-tiered hall is decorated with intricate hand-painted tiles and is packed full of stalls selling tropical fruit, vegetables, spices and flowers. Don't leave without sampling some fruit you've never heard of before and seeing the lively fishmongers work their magic on the catch of the day in the separate fish hall.